Complete Landscape and Hardscape installation, Renovation and Maintenance. Thank you for visiting our web page. Our company was founded in 1981 by Larry Ring. We are a full service landscape contractor. We specialize in a broad range of landscaping techniques and work hand-in-hand with a team of designers, horticultural and hardscape experts to bring you a well-rounded approach. 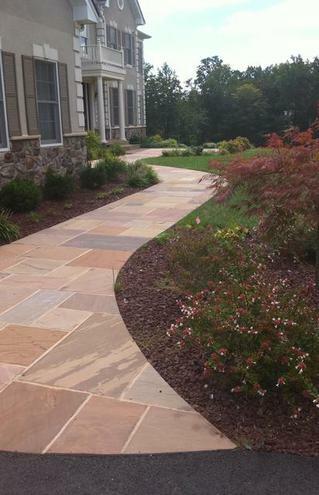 We follow the philosophy that each landscape is unique and provide each client with a personalized plan to fit thier specific needs. Cedar Ridge has won various awards at the Maryland Flower Show. Our patio designs have been choosen for publication in The Creative Patio books by the Schiffer Publishing Ltd.
Our crews work all around North Central Maryland. They leave our shop in Forest Hill every morning about 8:00am and return about 5:00 pm. Our crews consist of 2-4 men. Our two foreman have 35 years experience with Cedar Ridge and live with their families in Harford County. Our job sites will always have at least one Engish speaking crew member. Our labor force consists of American and "LEGAL" h2-b goverment visa workers. Our h2-b workers have been with us for 5-7 years and are in the United States from March till December each year. All paper work is available for your review anytime! Most of our h2-b workers speak English. Please ask our referrals about our work force. "LET US CREATE YOU ENVIRONMENT"
Office: 4701 Long Green Rd.